Prominent Ivory Trade Investigator Found Stabbed To Death In Kenya : The Two-Way Esmond Bradley Martin's innovative work as a conservationist and investigator made him one of the global authorities on elephant and rhino poaching. He was found at home with stab wounds to his neck. 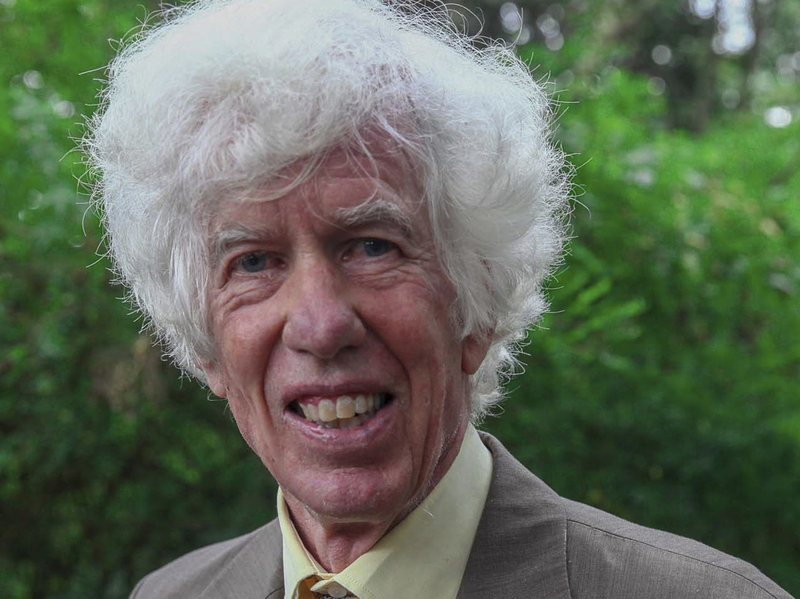 Kenyan officials say Esmond Bradley Martin, an American investigator into the illegal ivory and rhino horn trade, has been found stabbed to death in his house in Nairobi. Martin is seen here in 2016. One of the world's leading investigators into the ivory trade, Esmond Bradley Martin, was found stabbed to death at his home in Kenya on Sunday, The Associated Press reports. Nicolas Kamwende, head of criminal investigations in Nairobi, told the AP that a family member had gone to check on Bradley Martin after he failed to respond to phone calls, and found his body on a bed with stab wounds to the neck. Bradley Martin's innovative work as a conservationist and investigator made him one of the global authorities on elephant and rhino poaching. "It is a great loss," Dan Stiles, his colleague of many years, told NPR on Monday morning. "Esmond actually revolutionized the way wildlife investigations were carried out, because he was one of the first people to actually gather quantitative data. Posing as a buyer, he would go in and take surveys of all of the different items that he saw for sale. He would get the prices, he would find out where they were made, who was manufacturing them, where the materials came from, etc. So he produced some of the first very detailed, quantified studies of wildlife trade." But Stiles noted that such work could be risky. "There were times that the both of us were in rather precarious situations, because you can imagine, we're posing as buyers. And then if you don't buy, the seller can get a bit upset or suspicious at times. So we had to be very careful of the situations we put ourselves in." 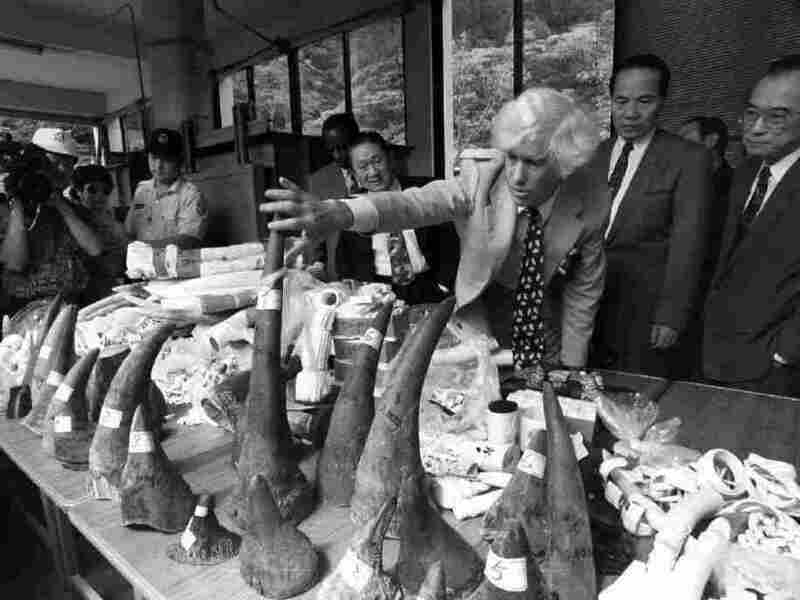 Bradley Martin is seen here in 1993 inspecting confiscated rhino horns, elephant tusks and ivory objects at the Taipei Zoo, in his role as a United Nations special envoy on rhino conservation. In 2007, Bradley Martin explained the misconceptions around the uses of rhino horn. "If I was going to die today, my biggest contribution academically would be to show that except for one small area in India, rhino horn has never been used by Asians for sexual purposes, not at all," he told NPR. The two main uses, he said, were in East Asia with the aim of reducing fevers, and in Yemen as handles for a kind of dagger called a jambiyya. A report by Bradley-Martin published last year by Save the Elephants found that the legal trade of ivory in China was waning in anticipation of the country's ban. That ban took effect on January 1. Reuters reports that Bradley-Martin's research was a key part of China deciding to ban trade of rhino horns, which was legal until 1993. Stiles said that based on what he had heard so far, Bradley Martin's death sounded like a botched robbery rather than a targeted assassination, and he added that unless the perpetrators are found, we may not know for certain. "Esmond was known for absolute rigor and painstaking precision in his methodology and reporting," Lisa Rolls, who leads UN Environment Program's Wild for Life campaign, said in a statement. "He was always willing to lend his decades of expertise to explore approaches to tackling the illegal wildlife trade with complete objectivity. Esmond's commitment to securing a future for wild rhinos and elephants was steadfast. To lose such a gentle and wise conservationist in this way is a shocking tragedy." "Esmond was a true giant of conservation and a champion for African elephants and rhinos," U.S. Ambassador to Kenya Robert Godec told the AP. "His extraordinary research had a profound impact and advanced efforts to combat illegal wildlife trafficking across the planet." In August, wildlife conservationist Wayne Lotter was shot dead in Tanzania. He had been a leader of anti-poaching efforts in that country.